Its 2/7/2016 and I just woke up from this dream: Warning: scary, horror. Driving in a stolen sports car doing a massively wide turn at a roundabout in the wilderness, then hitting one of two police cars as we slide around and crash into a boulder and tumble through the grassy plains to crash into a tree in the forest. I grab my companions and struggle through the forest, night falls as we approach a strange and weary village deep within. We try to avoid the village people as they seem deformed, scary and beast like in appearance fight one another as they ripped people apart and feasted on their flesh. Walking through the side of the village in the cover of darkness, we walk into a large pen-house like wooden structure to see about the wounds of our two comrades when two beastly men spotted us and come in on us, one grabbing a large knife and a Weeding Hand Tool and the other a large hay fork. I quickly pick up a large spoon like object from the ground and with no time I spin my hand around real quick striking the knife out if his hand as he tries to strike me. I look around, the other beast has driven his fork into my companion’s shoulder arm, and I’m feeling desperate now to help him. looking back at my opponent, he is coming at me with the sharp rusty weeding tool I move to the side, use the spoon object to block his attacking hand and shoulder him against the wall, I can’t think much but animal instincts of survival come over me and I strike his eyes with my fingers leaving it in pain and blindness. Then I see the other beast forking my wounded comrade now and i dash over to attack biting his face with anger I take his big fork and …. 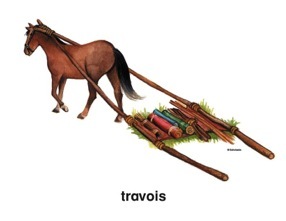 I pick up my wounded comrade and ask my companion to help the other, we hurry out into the forest, and I stumbled upon a travois on the ground. We placed both severely wounded comrades on it and I told my companion to pull it straight out through the forest to the road and don’t look back and I was right behind him in case anyone was following, but I went back found a barrel of flammable lard and creeping around their village pouring it around their huts….